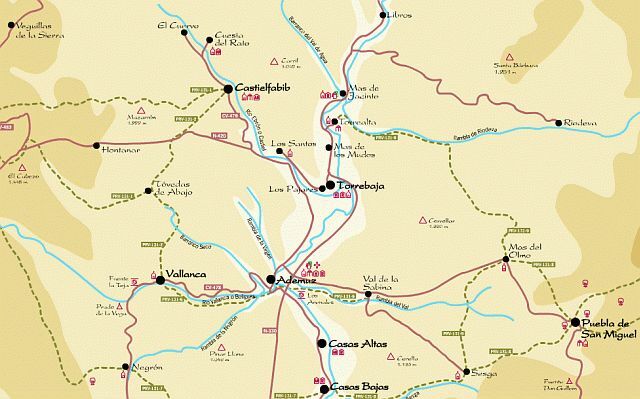 These Valencian lands located in an enclave, or corner (rincón) of terrain, between the provinces of Cuenca and Teruel have accumulated a stock of variegated customs and traditions thanks to their position as a crossroads. They have been the object of continuous conquests and reconquests throughout their history. United to Valencia by the Treaties of Cazorla (1179) and Almizra (1244), this area was won from the Moors by Pedro I of Aragón in 1212 - a prelude to the future conquest of the entire realm - and again by Jaime I in 1259. Annexed to Teruel province on two occasions and later returned to Valencia, the Rincón de Ademuz has experienced multiple administrative changes down to the present day. From Casas Bajas to Cuesta del Rato, visiting Casas Altas, Ademuz, Puebla de San Miguel, Torrebaja, Vallanca and Castielfabib.